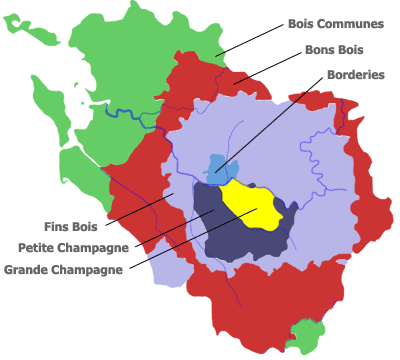 The Grande Champagne is the core region and has a chalk-based soil, as does much of the next zone, the Petite Champagne. As one moves outwards, the chalk changes to limestone and then sand, through the Fins Bois, Borderies, Bons Bois and Bois Communes. These soils yield spirits with different textures and aging capability — important factors when attempting to duplicate a blend a million bottles a year for decades. 98% of the Cognac vineyards are planted with ﻿﻿Ugni Blanc﻿﻿, although miniscule parcels of Folle Blanche and Colombard exist. The wine from these grapes reaches a very low alcohol level (7-9 degrees) while retaining high acidity. Wines of this sort, particularly from chalky soils, are ideal for distillation. They are usually distilled several months after the harvest. Pot, also known as the boiler. The wine enters a central dome and gradually flows into a heating tank, under which a flame burns steadily. As the wine approaches the boiling point, a vapor begins to rise (just as it does with boiling water). This steam collects against the inside of the still's head then searches for a place to escape. Its only exiting point is a hole that leads to the curved pipe known as the swan's neck. Gravity then takes the vapor downward through a pipe coiled around a holding tank filled with cold water. From there it reconverts into liquid and exits the still with an alcohol level of around 28% or 56 proof. A distiller carefully surveys the entire process. The first spirits to come out of the still, known as the têtes or heads, normally contain such high levels of impurities that they are discarded. The majority of the distillation, called the brouillis, is kept. The wine that takes the longest time to distill and remains at the end, called the queues or tails, is normally too weak and stripped of flavor to produce anything worth keeping. Consequently, like the heads, the tails are often discarded. The useable material (brouillis) from the first distillation is collected and housed in holding tanks. Afterwards, it is reinstated in the still and processed again. The second time there is less waste material, and 99% is kept. The spirit exits at a higher strength this time, normally in the range of 67° and 72°. It goes straight into barrels made of either Limousin or Tronçais oak that average around 350-liters in size. As the eau de vie exits the still at around 144 proof, alcoholic reduction begins at a very early age. This reduction is either done with distilled water or petites eaux (a 60-proof blend of distilled water and Cognac). These additions are made once or twice a year. Most Cognac finally reaches the market between 80 and 86 proof. Whereas it is common to have single-vineyard, single-vintage Armagnacs, most Cognacs are a blend of various vineyard plots and vintages. The reasons for this are mostly to fulfill the enormous worldwide demand for Cognac. Armagnacs and Cognacs fewer than 10 years old comprise more than 90% of the world market. Yet these offerings are not the examples by which one should judge either of these spirits. The adulteration of these young brandies is widespread. Their reduction process tremendously cuts their concentration. As a result from the skills of those in the blending laboratory, it can be difficult to determine which flavors are pure and which simulate flavors that would normally arise after a much longer aging period. This is similar to the case in the wine world with wood chips, chaptilization, addition of supplementary varietals, etc. Many producers and négociants, realizing that they are not serious products, will not even taste VSOP or XO-level releases to journalists or connoisseurs. What's the difference between Cognac and Armagnac? Being France's two finest grape brandies, it is only natural to mention Armagnac and Cognac in the same phrase. Historically, however, Cognac has always stood in the spotlight, with Armagnac playing the understudy, waiting in the wings for its big chance. In the 1600s, Bordeaux was a major port for shipping wine to England and Holland. Wine tended to oxidize during long sea voyages, but fortifying it with brandy protected it from spoilage. Cognac — being closely connected to Bordeaux by the well-traveled Garonne and Charente Rivers — became the obvious place for the Dutch and British to seek fortification material. Because of its proximity, Cognac's brandewijn (burnt wine) or brandy had an immediate outlet. 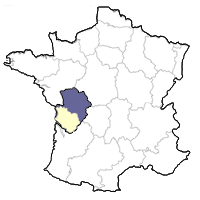 Map showing the relationship between Cognac and Armagnac in southwestern France. People soon discovered that Cognac produced a spirit that was finer than those from other boat-accessible cities such as Nantes and La Rochelle. Demand for the spirit grew and investment besieged the Cognac region. Armagnac distillers, however, were caught in a geographical trap. Getting their product to Bordeaux was much more difficult. As a result, the Armagnac region was isolated from the lucrative, aggressive and well-connected British and Dutch markets flourishing in the Charente. So while investors in Cognac watched their gold coins mount, producers in Armagnac were forced to enjoy their spirit at home after a hard day in the fields. Beyond geography, over the centuries Armagnac producers faced other obstacles to attaining its place in the spotlight. Vine disease, bug infestations, and lack of standards hindered the growth of the Armagnac industry while Cognac enjoyed worldwide popularity. Armagnac slowly began to strengthen its reputation in the 20th century by establishing quality controls and standards. Additionally, Internet access has allowed many people who otherwise might not know of Armagnac to discover this unique spirit from the Gascony region of southwestern France. There are a number of major differences between traditional Armagnac and traditional Cognac. Armagnac's grapes are split between Ugni Blanc, Folle Blanche, Colombard, and Bacco. Cognac's grapes are comprised of 98% Ugni Blanc. Armagnac's best grapes are grown on sandy soil in predominantly warm temperatures in southwestern France. Cognac's best grapes are grown on chalky soil with predominantly mild temperatures about 100 miles north of the Armagnac region near the Atlantic coast. Armagnac is generally aged in Limousin or local Gascon oak. Cognac is aged in oak from the Limousin and Tronçais forests. Traditional Armagnac is often single-distilled in a mobile alambic. 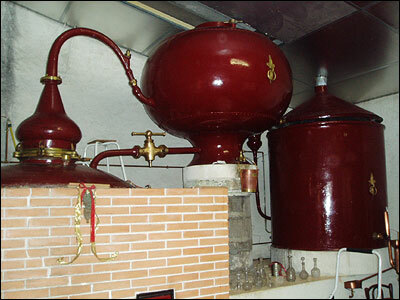 Cognac is required to be distilled twice in a pot still. Traditional Armagnac has an alcoholic content that is normally between 46° and 48°. Cognac is reduced with petites eaux or distilled water to 40°. Traditional Armagnac is given a vintage date. Vintages are extremely rare in Cognac. Instead, Cognac is nearly always a blend of various vintages. Single-varietal Armagnac is common, especially Folle Blanche. One rarely sees a varietal printed on a Cognac label. With regard to grapes, distillation type and politics of reductions, consumers and especially connoisseurs should become aware that Armagnac and Cognac are distinctly different products. Generally speaking, at the fifteen-year mark, a single-distilled Armagnac has a fatter texture than a double-distilled Cognac. (This could be comparable to the difference between vodka in the freezer and vodka at room temperature). Armagnac tends to show more primary fruit than Cognac because of its grapes and because the outgoing vapors are forced into contact with the incoming wine during its sole distillation. The most typical fruit includes vine flowers, orange, plum, quince and apricot. Cognac's fruit tends to be lighter (pear, orange) and more floral. The reaction with Armagnac and the sugars of the oak often yields notes of vanilla, caramel, toffee, buttered toffee, maple syrup and exotic note of coconut milk. Cognac's interaction with oak normally delivers plenty of spice, but frequently herbal, steamed and resinous notes as well. Traditional Armagnac is not reduced. Therefore, its heightened alcohol helps push its concentrated aromas from the glass. Cognac's aromas are not always as forthcoming as those of Armagnac since Ugni Blanc is its chief grape and because Cognac is diluted to 80 proof. With aging, Armagnacs often develop intriguing earth and smoke aromas. Cognac's alliance with wood is often more in balance, yet rarely does it give the complexity that Armagnac offers. Armagnacs generally hit their peak between 20 and 30 years of age. Cognacs are the better long distance runner, however, perhaps due to their higher alcohol. They often peak around the 30-to-40-year mark and develop extremely subtle rancio notes. After 35 years of age, most Armagnacs and Cognacs that stay in barrel begin to decline. Not only does the alcohol begin to drop below the legal 40%, but the wood notes begin to dominate the fruit. While Armagnac perhaps peaks by its 30th birthday, a well-raised Cognac (perhaps because of its higher initial alcohol degree) can continue to evolve until its 50th birthday. Fresh fruit (plum, apricot, pear, quince) and floral notes evolve to preserved fruit (imagine the aforementioned as jam) then dried fruit. Hard toffee changes to soft toffee, then cream or even butter. Slow oxidation in cask causes almond and walnut notes (rancio) to surface. The barrel, which once gave pepper, clove and cinnamon notes, finally overwhelms the remaining fruit with tannin. Read about independent Cognac producer Cognac Dudognon. "Cognac" by Charles Neal. This series was orginally published in 1999 and is updated periodically.